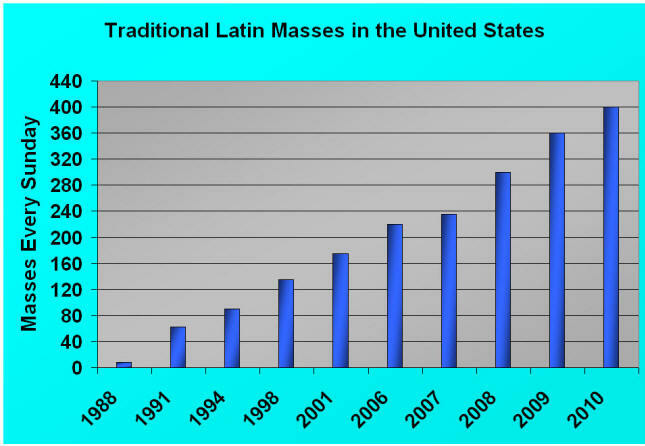 These figures show the number of Traditional Latin Masses in the United States in November of each year. CATHOLICS, Do You Know? . . .
On July 7, 2007, His Holiness Pope Benedict XVI issued his motu proprio Summorum Pontificum, which allows every priest in the Latin Rite to offer the Traditional Latin Mass without permission from his bishop, effective September 14, 2007. This expands upon the pastoral concern expressed by his predecessor, Pope John Paul II, who in 1984 authorized the Traditional Latin Mass of the Roman Rite to be offered with approval of the local bishop. This was the Mass as was said in every Catholic Church around the world until after Vatican II. In his Apostolic Letter Ecclesia Dei, (July 2, 1988), His Holiness expanded this earlier permission: "By virtue of my Apostolic Authority I decree ... (that) a wide and generous application" be given the previous directives. The Mass has grown slowly and steadily since that time in the United States. Pope Benedict XVI, while Prefect of the Congregation for the Doctrine of the Faith, consistently showed his support for those Catholics who wish to worship in the old form of the Mass of the Roman Rite. Now the Catholic faithful should write a short letter to their pastor or nearby sympathetic priest to request the Traditional Latin Mass on Sundays and weekdays, according to the provisions of Summorum Pontificum. Many priests have quietly studied to learn the Traditional Mass. Dioceses are calling upon experienced clergy to train other priests. The Priestly Fraternity of Saint Peter and the Institute of Christ the King are involved in training programs. An extensive tutorial has been prepared by the Canons Regular of Saint John Cantius and is available online at: www.sanctamissa.org. "...we ought to get back to the dimension of the sacred in the liturgy. The liturgy is not a festivity; it is not a meeting for the purpose of having a good time. It is of no importance that the parish priest has cudgeled his brains to come up with suggestive ideas or imaginative novelties. The liturgy is what makes the Thrice-Holy God present amongst us; it is the burning bush; it is the Alliance of God with man in Jesus Christ, Who has died and risen again. The grandeur of the liturgy does not rest upon the fact that it offers an interesting entertainment, but in rendering tangible the Totally Other, Whom we are not capable of summoning. He comes because He wills. In other words, the essential in the liturgy is the mystery, which is realized in the common ritual of the Church; all the rest diminishes it. Men experiment with it in lively fashion, and find themselves deceived, when the mystery is transformed into distraction, when the chief actor in the liturgy is not the Living God but the priest or the liturgical director."